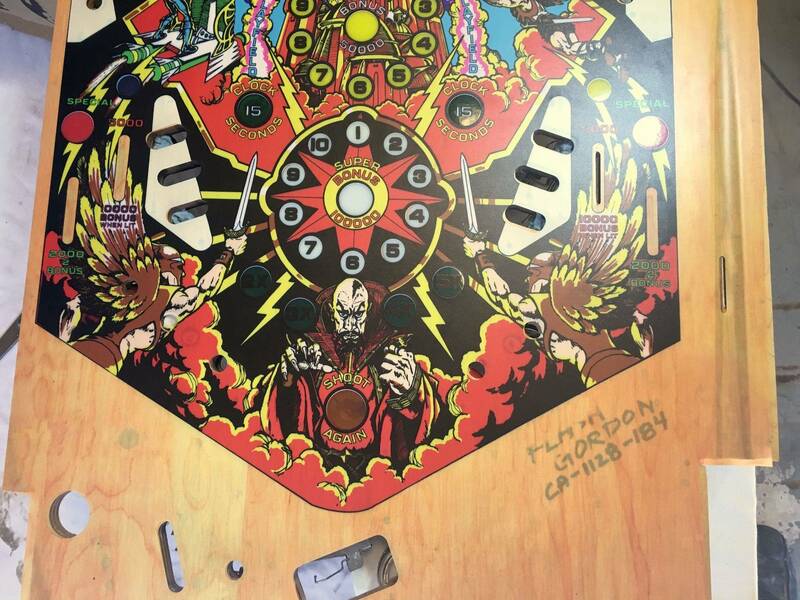 Been looking for a CPR or NOS Playfield for a Flash Gordon I picked up last week. 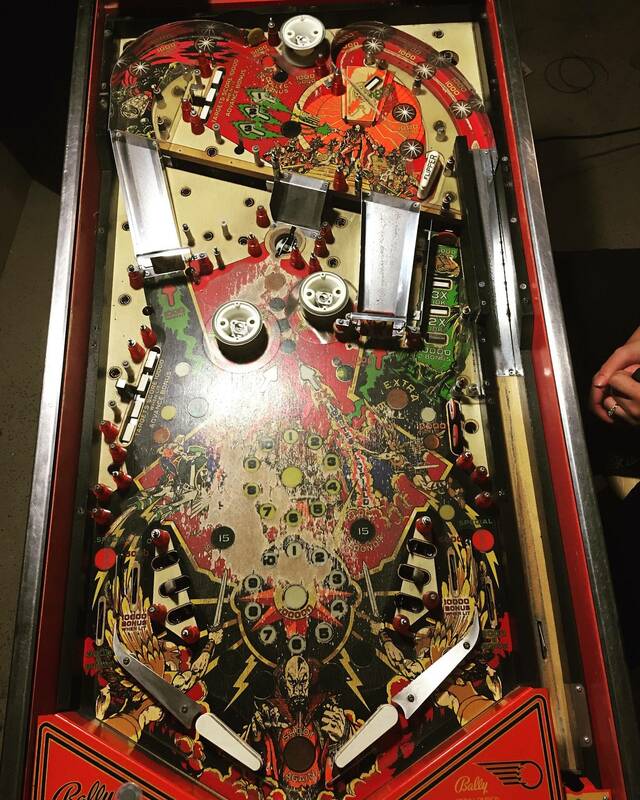 Playfield was trashed and I was bummed that no one was selling a Playfield for this game. 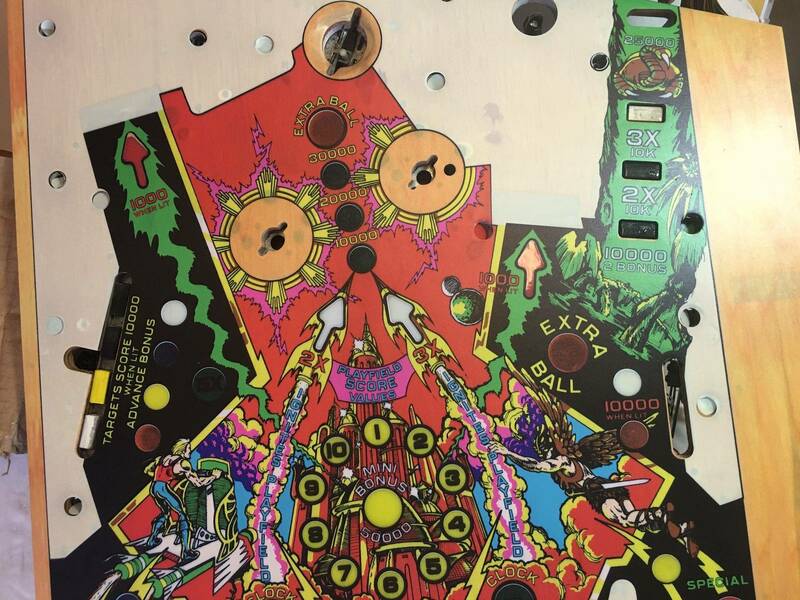 I heard that there was a Playfield scan floating around the inter-webs, but I had no luck finding out where that was located. I contacted Todd over at TNT and he told me where I could pick one up. 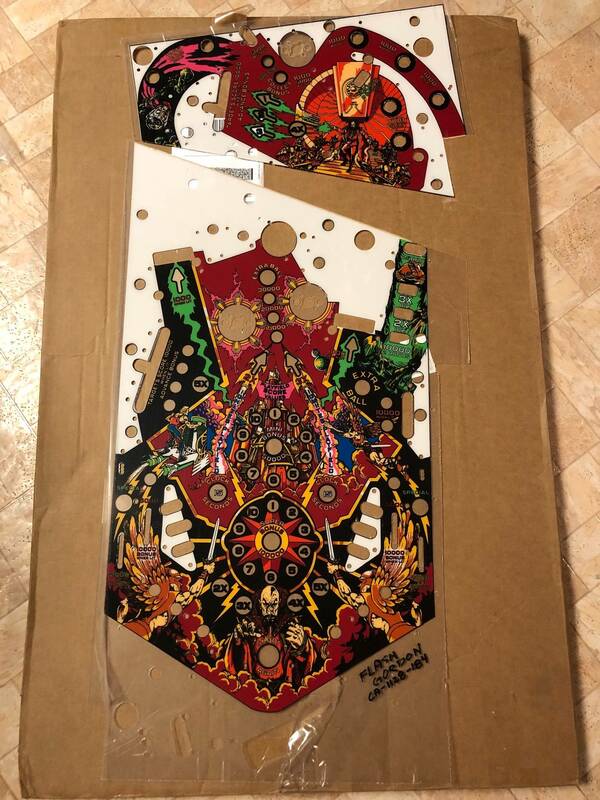 Luckily Pinballdecals had one left and I just got it in. It's not perfect, but I'll be able to restore this game and play it till I can come across a CPR or NOS. I'm excited to get this thing layed down!! Andyzola87 last edited this post 1 hour ago. 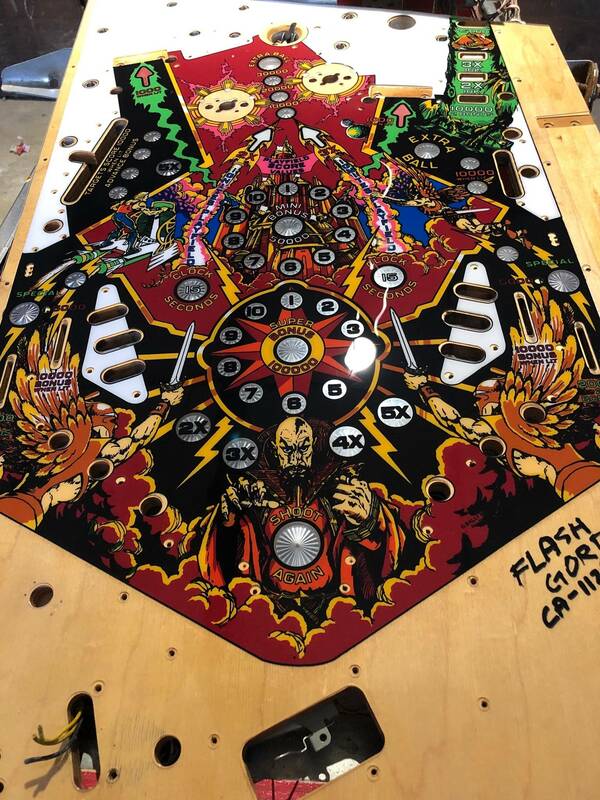 I would love to see how this comes out...I am looking for a replacement playfield for my high speed and have been unable to locate one but there is an complete overlay available. I may have to go that route. I'll be starting it this week so I'll keep you posted . 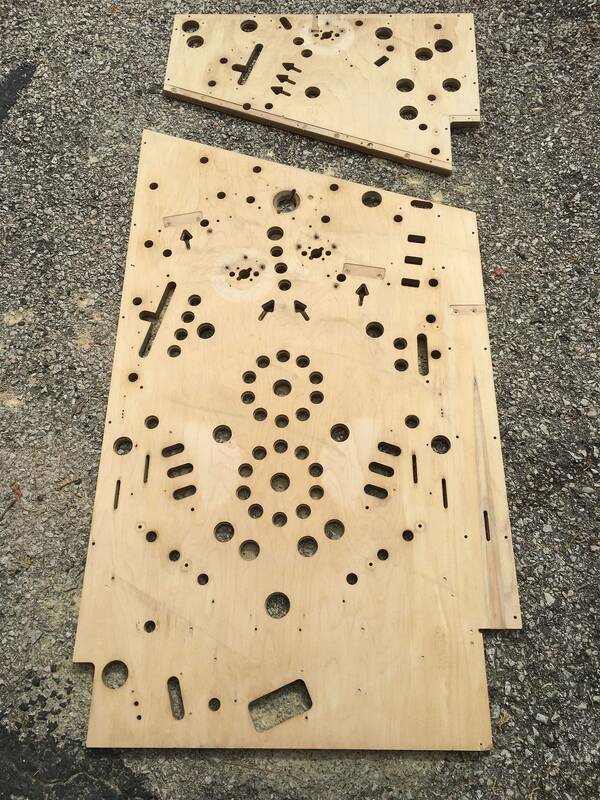 Took everything off the Playfield and Started sanding. You can see the before and after pics. 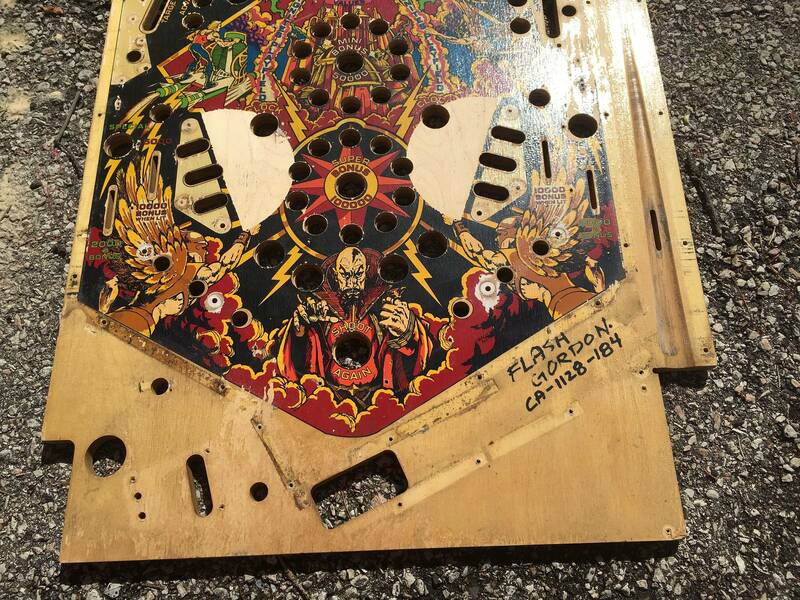 This Playfield was pretty trashed. I'm gonna try something different that I haven't seen on any old Bally's. 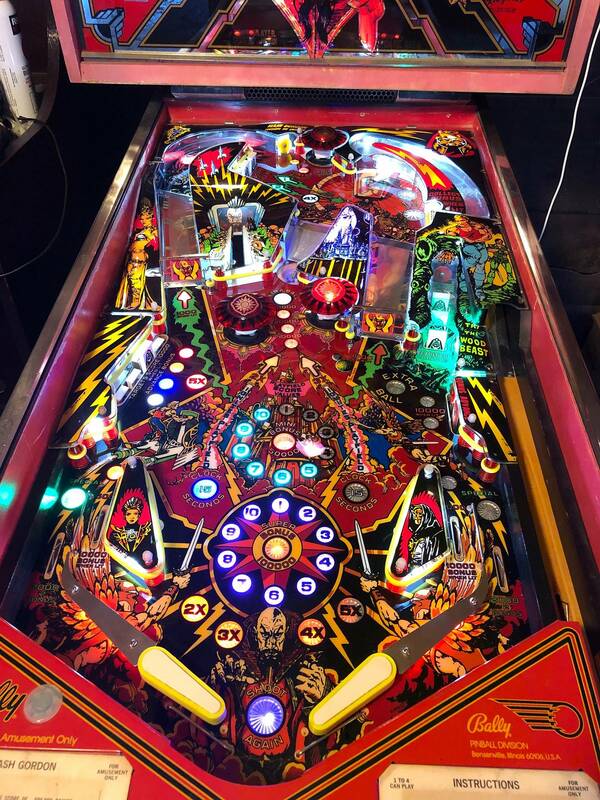 I'm gonna replace all the inserts with clear inserts, like you see ok modern Stern games and use LEDs so I can choose what color I want the inserts to light up. I have all inserts on order and will post some pics once I get them installed. Doing this on mine also. Just bought an overlay and need to get it done this winter. I've got a little wear also. Every flash gordon i see is mint or worn to the wood (not much in between) , did they have problems with the ink on those playfields? That overlay looks identical to one that was installed on my FG last fall. Couple of things to be aware of, at least on my game it was not possible to perfectly align every insert with the overlay, so you may have to make some hard choices on how to approach it. Here is the trashed PF before the overlay. Here is the overlay applied. Most of the inserts have a white ring around the top of the circle, this is in the overlay itself, must be due to improper alignment when they printed it? (See the green Clock Seconds inserts where it really stands out against the dark background). The insert misalignment shows up in a few places, look at the red arrow at the top left of the lower pf picture, there is quite a gap of bare wood between the overlap black outline and the red arrow insert itself. Also notice that the overlay is missing the darker red, almost burgandy shading from the original. It's almost as if the red in the overlay matches the highlight red color from the original. 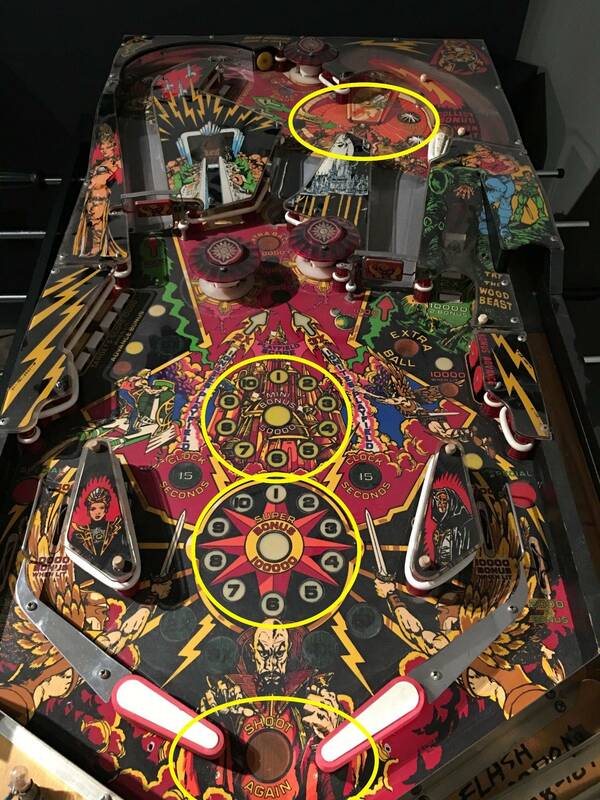 See the circled areas in the pic below of a stock playfield for where the missing second-shade of red is noticeable. Even with the defects, it still much nicer than the original PF. However, working with the restorer we decided to add touch-up paint to the overlay (after a thin layer of CC was applied) to a few areas to try to improve things a bit. In the picture below you can see that the missing 2nd shade of red in the center star area was painted back in. It is subtle but really makes the center of the PF pop in comparison! It would be too complex to attempt to add it to all the areas it is missing, but I think it really makes a big difference for the center star. The gap between the red arrow insert and the outline was filled with matching red paint, so it is far less noticeable now. Some of the round inserts that had similar but much smaller gaps were filled in with black outlining, rather successfully IMHO. Here's before and after of the upper PF for example. Factor in you're most likely going to need LEDs for all the inserts after this swap...the overlay blocks a lot of light. I think it's just what happens to a very popular 35 year old game with timelessly fun gameplay that was manufactured before automotive clearcoat. You see the odd one that had full mylar applied from day one that is still pretty decent, but any without mylar are usually toast. Says a lot about the game if people still played them even without the paint on the pf. Thanks for the pictures and comments! The overlay I have came laminated with clear vinyl over it. The guy said it was already clearcoated and you can see the gloss on it from the second layer of film. 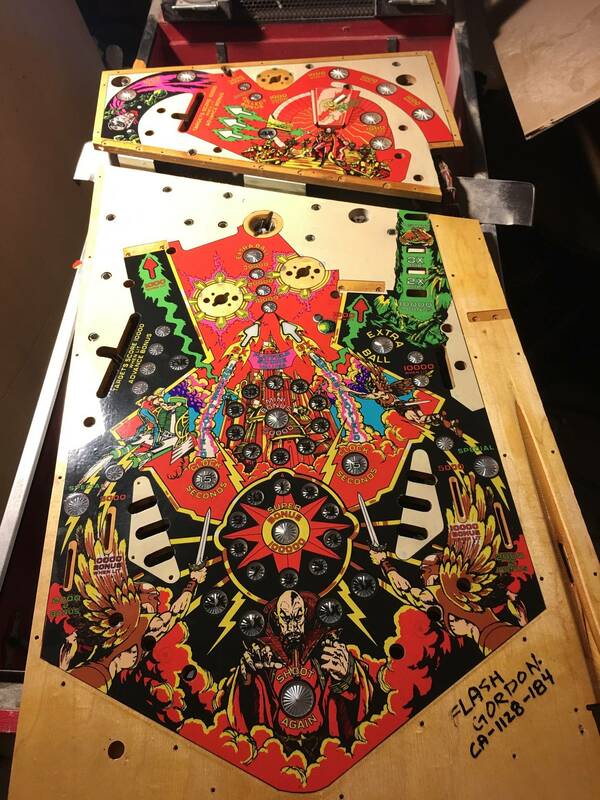 I was going to clear it, but I'm just gonna install a Playfield protector over it once I finish. Yeah that should work great. 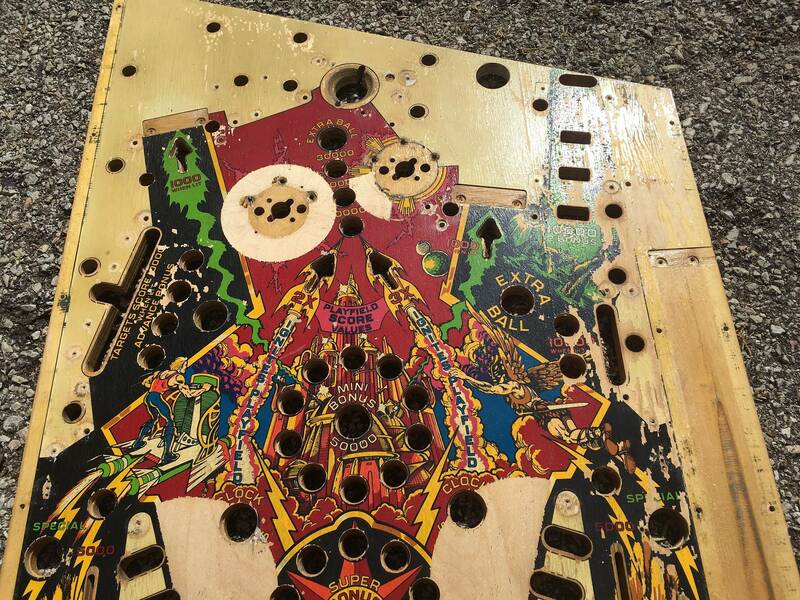 Finished sanding the art off the Playfield. Installing new clear inserts. Need to glue and level inserts, then clear coat and then the overlay will go on. 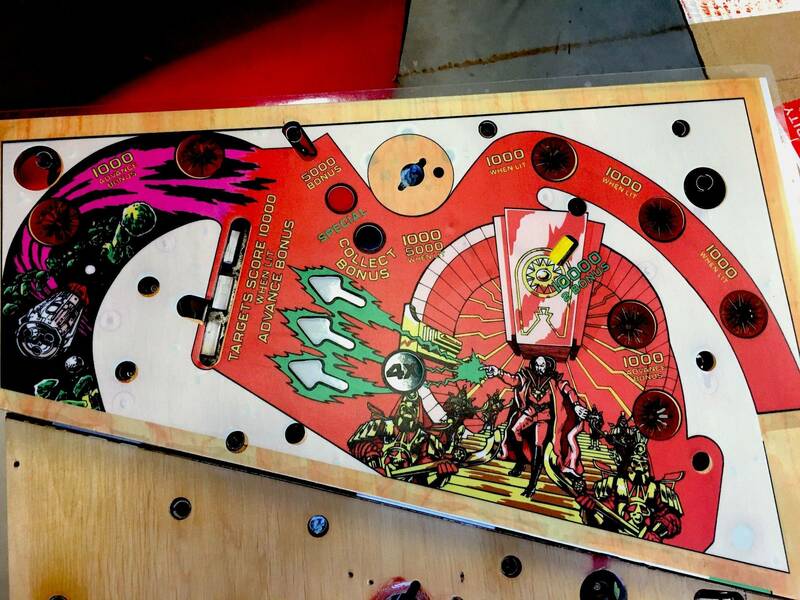 Newbie question time: Is an overlay just like a big sticker of the artwork placed over the original toasted Playfield? Second: If you go the overlay route, why bother eventually swapping in a new PF? It seems like you get the same effect, so is it just because a real painted PF is nicer than playing on an overlay? isochronic_frost. Yes. 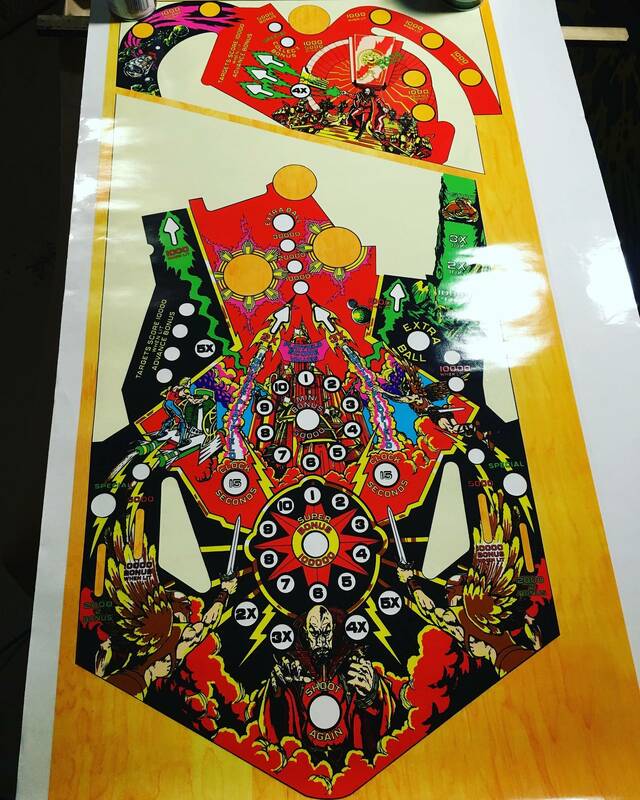 Overlays are basically a printed sticker that you place over a prepared Playfield. Most overlays are not 100% accurate to the the original artwork and most of them have issues with not lighning up correctly to inserts and such. However in my case, since I couldn't find a NOS or CPR Playfield, it's the best I could Do. Eventually I will get a CPR or NOS and swap it out. bookmarked. mostly can't wait to see what your clear inserts look like lit up. are you buying a different lamp board? 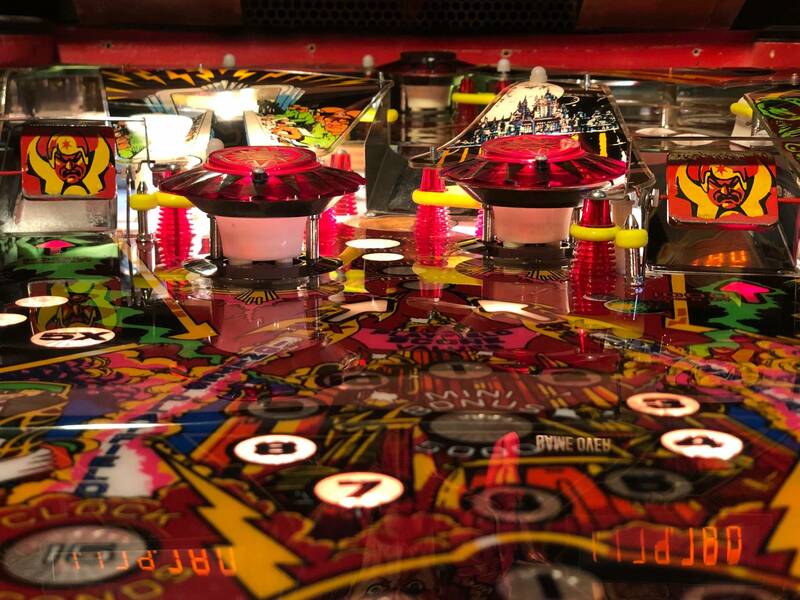 nikpinball. 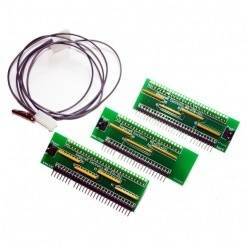 I have the Bally/Stern adaptor boards that go between you standard Lamp driver board and the connectors. They worked good on my Xenon, so they should work on Flash as well. Really excited to have flexibility on color choice for the inserts. I'm using the ablaze 4smd led bulbs so it should be interesting lol. Started leveling and glueing the bottom half of the inserts tonight using plastic CA primer and thick CA. I did some test runs on a few insert and to make sure that method would work and they bonded very well. 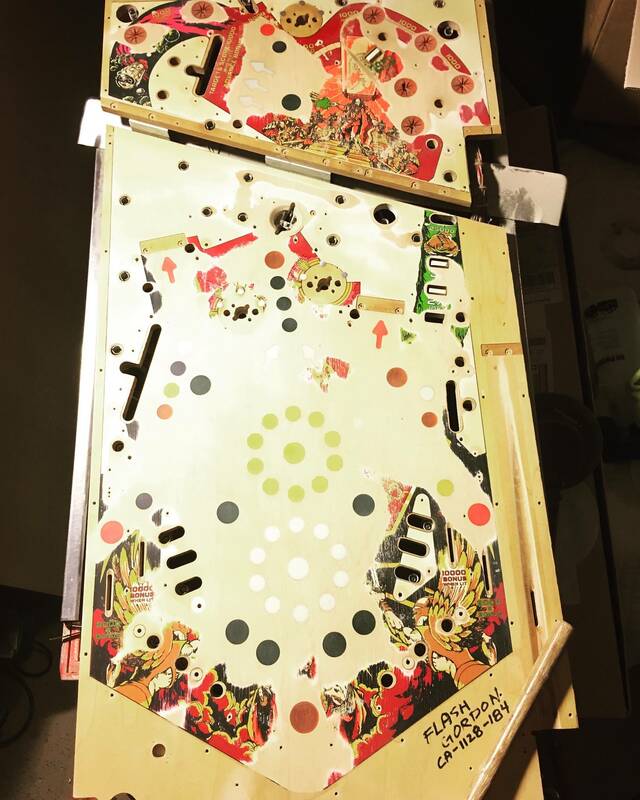 gonna try finish the Playfield by Wednesday. Cool choice on the clear inserts,led's are colored anyway,away with the old crap! pinballrockstar my thoughts exactly lol! I think the clear inserts and esp. the ablaze 4smd leds are going to be way too f'in bright! At least your pupils will be fully constricted so when the backbox flasher goes off you won't hardly notice it. Seriously though, be prepared to swap out the 4smd's for something a little dimmer. Well, the overlay only uses transparent windows for the inserts so it doesn't seem like it will block too much light. I went with comet 1 LED retro bulbs for the playfield lamps, hopefully they won't be too dim. Well, the overlay only uses transparent windows for the inserts so it doesn't seem like it will block too much light. I went with comet 1 LED retro bulbs for the playfield lamps, hopefully they won't be too dim. Yep yours seems diff'rent than mine...my inserts have an opaque or milky look to them, not like yours. I've done a few of these overlays. 2 flash gordons last winter then I did a xenon this past summer. The flash gordons I ordered within a couple months of eachother. The first was a thinner vinyl that was a pain for bubbles and stretching. The 2nd one was a thicker material that performed much better. I suppose I see why people don't like overlays. The quality is inconsistent. But, I suppose it's better than having no option at all. Wish overlays were available for more games.... 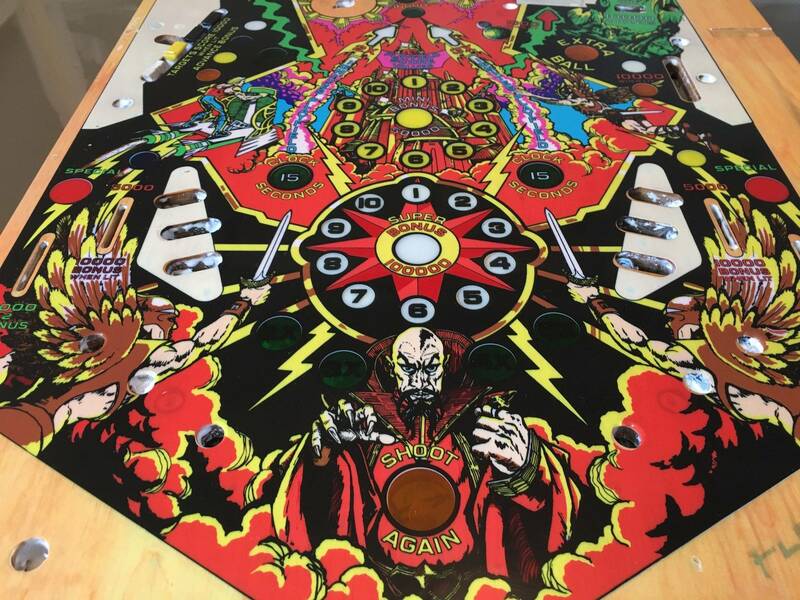 Sometimes it just doesn't make sense to stick in an 800 dollar CPR (if they ever make it) playfield into a $500 game.
. 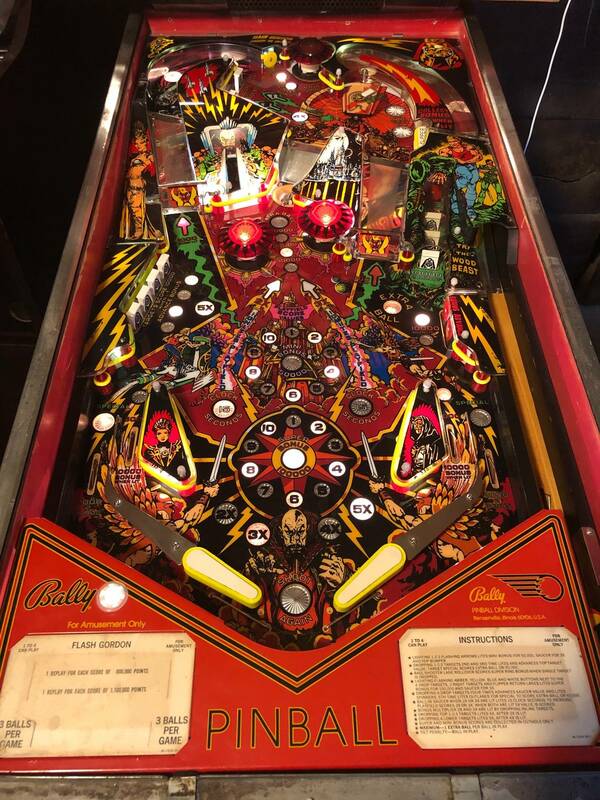 Sometimes it just doesn't make sense to stick in an 800 dollar CPR (if they ever make it) playfield into a $500 game. At <$1000 FG is the biggest bargain out there IMO. It's my favorite in my lineup. fytr You may be right. I'll know once I get them in there lol. I'll second this, if you look at the pics I posted above of the applied overlay you can see the white areas are semi-transparent. If that might bother you I'd plan on painting those areas white before applying the overlay. 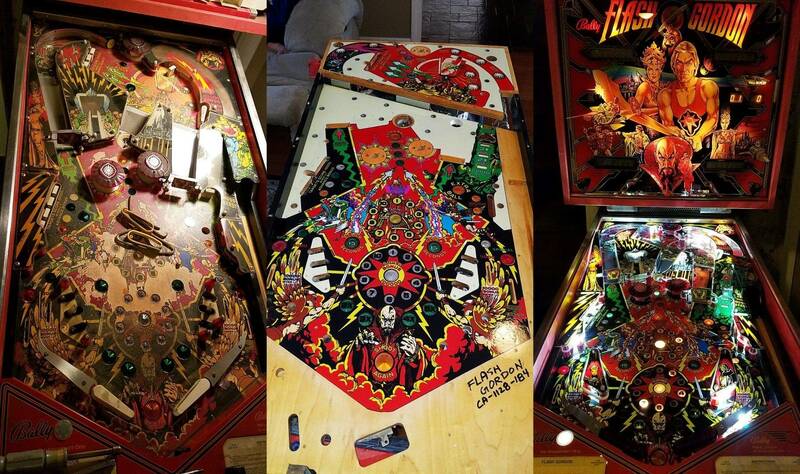 nikpinball it's been to cold to lay down the clear coat. I don't have a heated shop unfortunately so I gotta wait till it warms up a bit. Got the overlay down and it's ready for reassembly! Andy, did you ever finish? You don't play the paint! 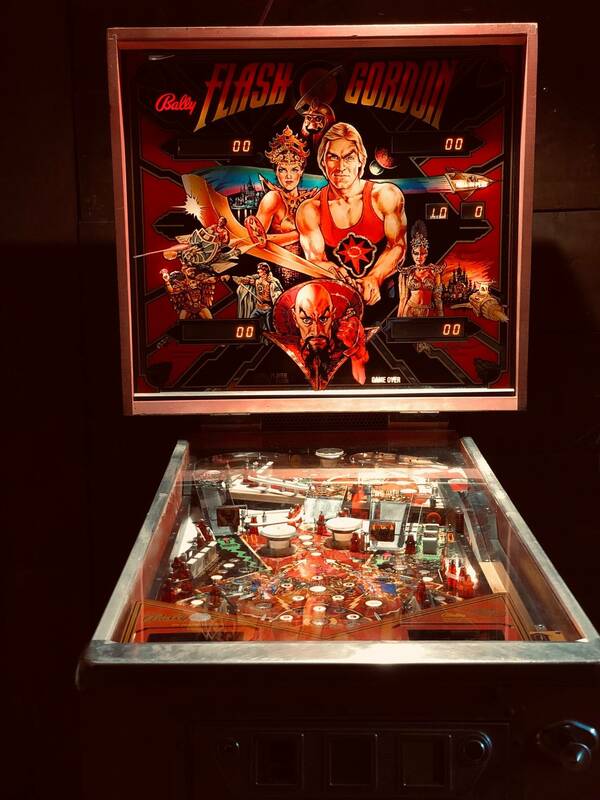 I just started working on my Flash Gordon today. 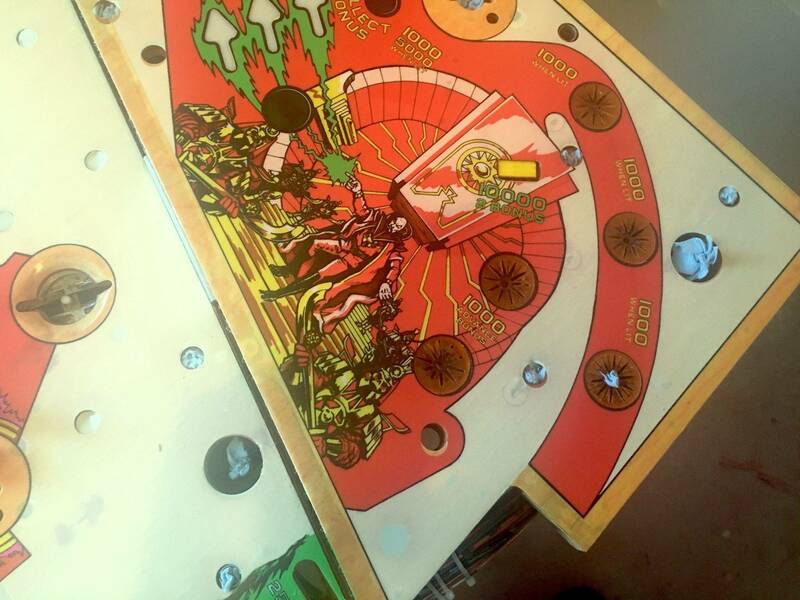 I picked up an extra trashed playfield in case it didn't turn out well so that I'd still have a complete game set up. 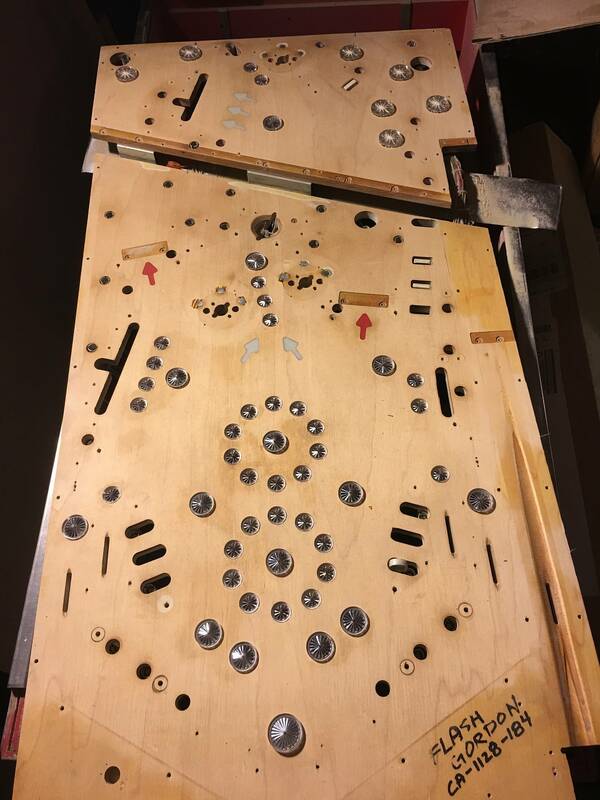 I've stripped all the parts off the extra playfield, removed all the pop bumper screws, and removed all the inserts. The wood was completely sanded down to bare wood, I've patched a few small nicks in the wood, and one place by a pop bumper screw where the top layer chipped off when I pulled out the screw. All of the original inserts were sanded down flat with 320 grit sand paper. 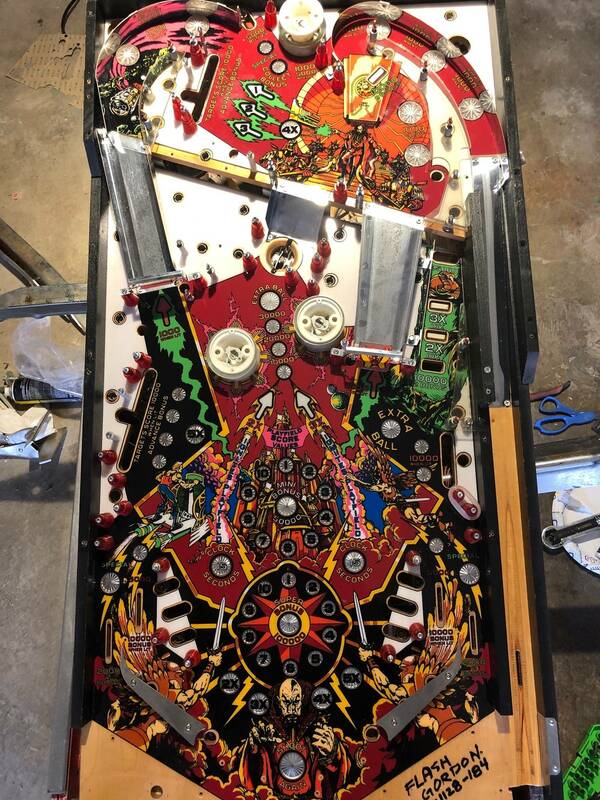 There are 7 star rollovers in the top playfield where I clipped off the end of the star and pulled it out, so as not to break the insert, and will order new white stars to install later. 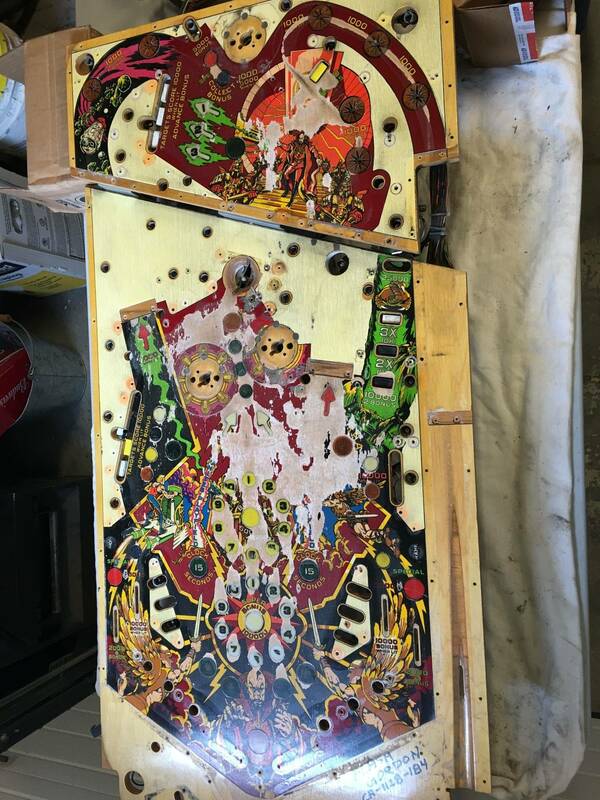 My plan is to reinstall all the inserts and level them like you did with the plastic primer and glue, and then clear coat the bare wood with the inserts installed, making any corrections to any small divots that may show up after a first coat. I like your idea with the all new clear inserts, but I don't think I'm going to go that route myself. I haven't been much into LED's other than behind the back glass for heat issues. 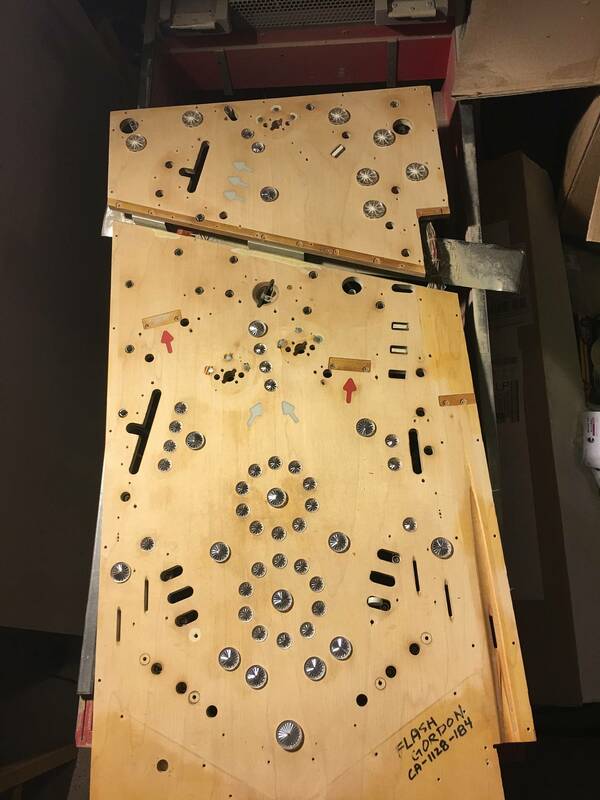 When you installed your overlay, what's the best course of action in dealing with trimming out all of the little holes? Especially around the kicker. 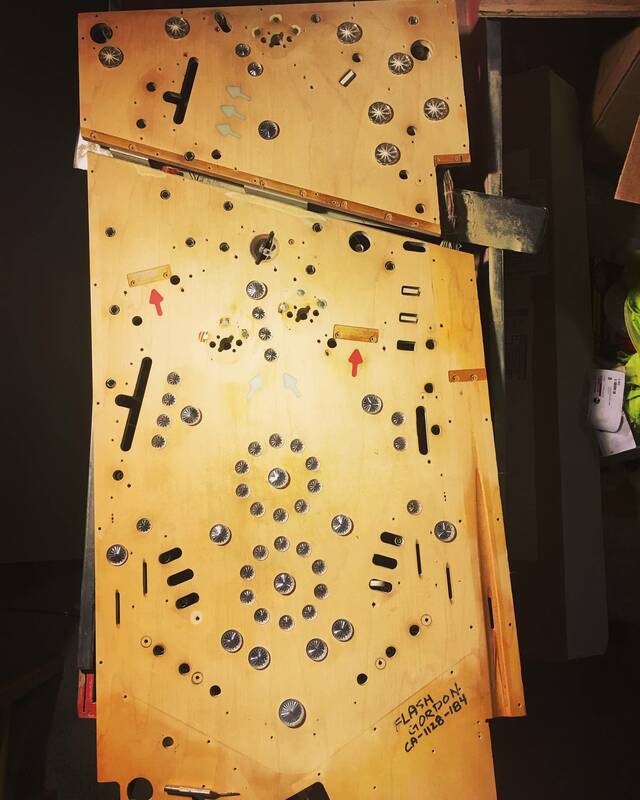 Or did you cut out the kicker hole first before installing the overlay? 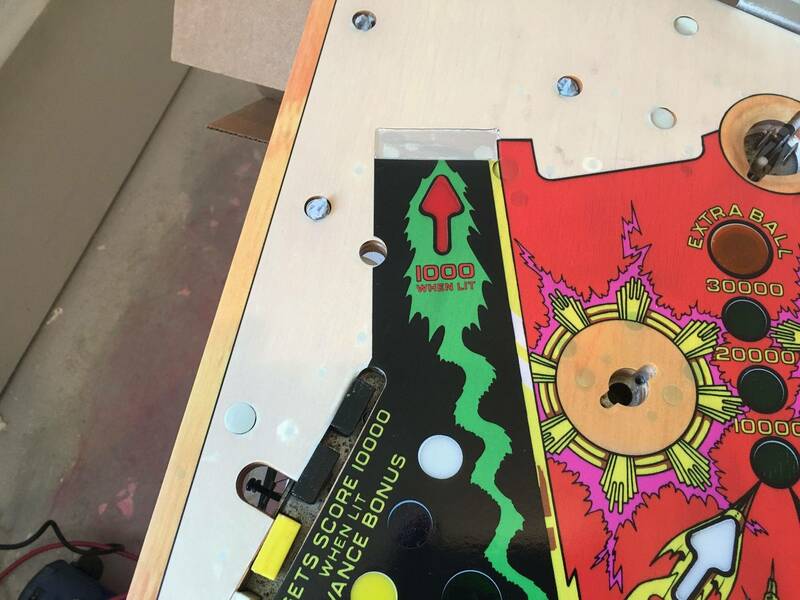 Anything that needs to be mentioned before clear coating OVER the overlay to lock it in after all the holes have been carefully trimmed out with an exacto knife? Looking to use an automotive clear coat over this this obviously. I think I got my playfield overlay from classic arcades a few years ago, but I don't remember 100% on that. I haven't finished yet but soon it will be ready. 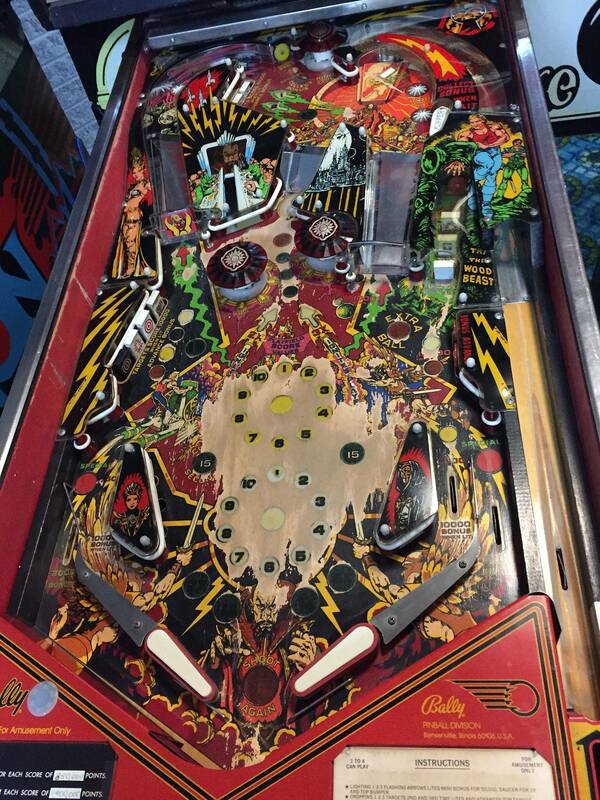 My issue was protecting the Playfield once I layed down the overlay. 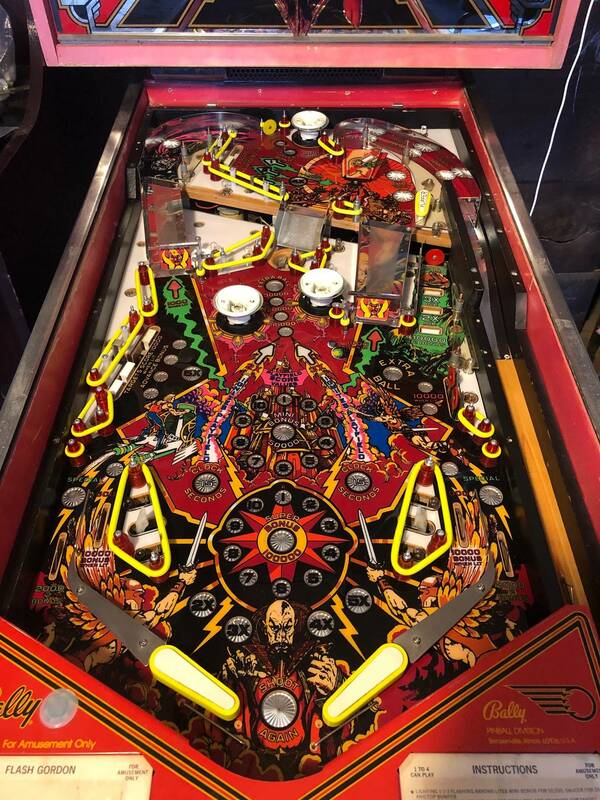 I decided to use a vivak Playfield protector but needed to raise the rollovers so they would still work properly once to protector is installed. I'm almost done but it will be about a month or so before I'm finished. andyzola87 Any more progress on your FG machine? 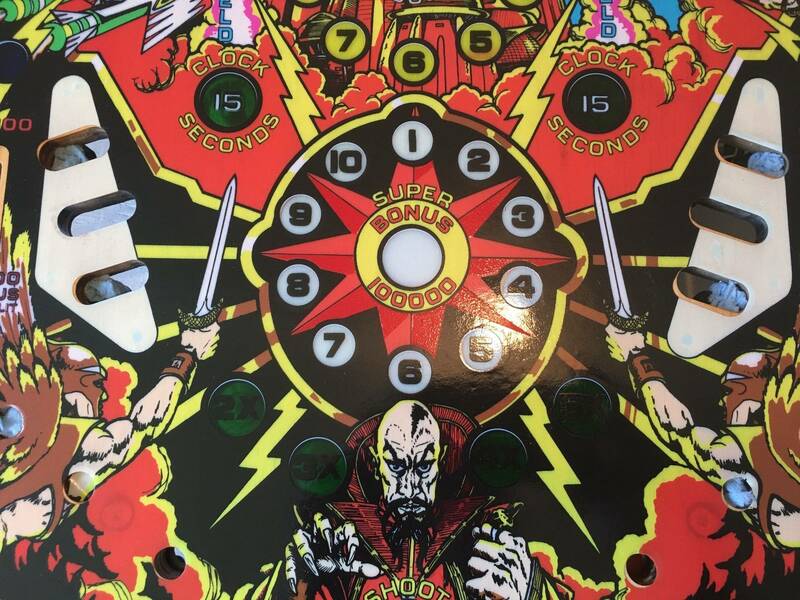 I'm about to install a new overlay on my flash gordon pinball machine, and I wanted to see if you had any advice, haha. It’s currently in storage waiting for the Hardtop product to be produced. 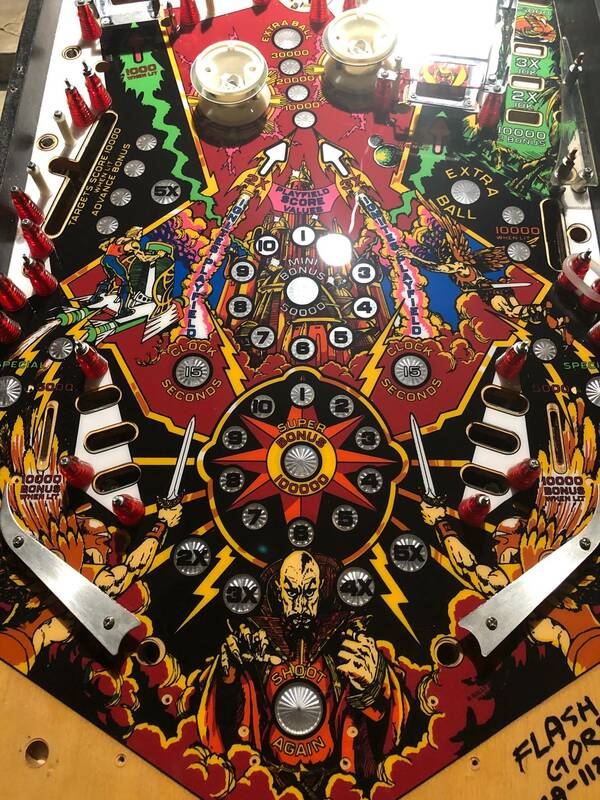 I had issues with the playfield overlay bubbling after I cleared the PF because I didn’t wait long enough for my clear to dry and it gassed out and caused bubbles under the overlay. 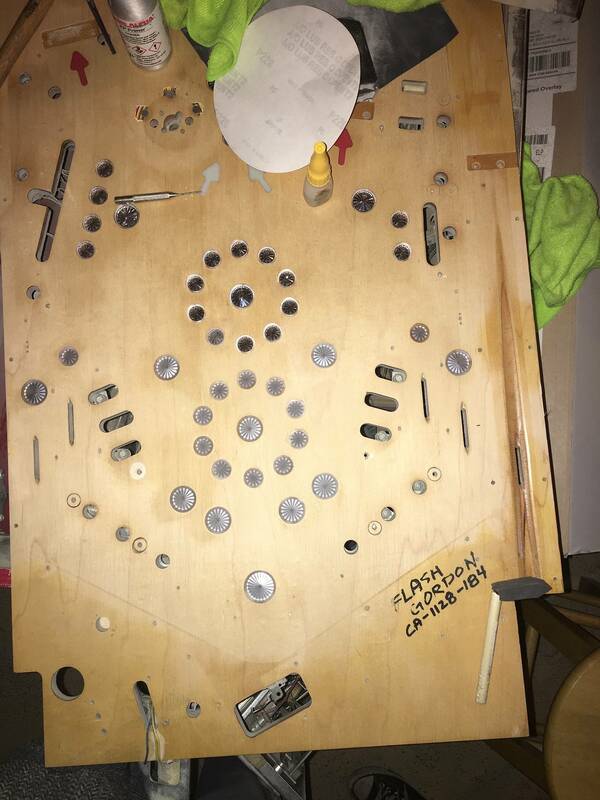 If I could give you any advice I would say make sure your clear has fully cured before you lay down that overlay and after you lay it down maybe place a piece of acrylic over the whole playfield and place weights on it to hold it down. I’ve been keeping track of your restore project and it looks really good, keep up the good work and let me know if you have any other questions. Awesome!! Thanks so much for the advice, andyzola87. Really appreciate it! I'll definitely let you know if I have any other questions. eabundy Nice job! It really turned out nicely. So I finally have some updates! I got my hardtop in end of last year and I’ve slowly been putting this game back together. The last two months have been busy but I’m done with the hardtop install. Here are some pics of my progress. I’ve been posting in the FG thread but I’ll make sure to update this post as well moving forward. I just finished the led install tonight and I’m gonna play around a little with the color layout of the insert LED’s to get the look I want. All LEDs are from Comet. I used 2smd frosted for G.I. and faceted 2smd for inserts. Love the look of the LED’s with the clear inserts. They are pretty bright so I may sand the tops of the faceted covers to help diffuse the light a little more so it’s not so blinding. This is the setup so far. Let me know what you guys think.